BPA stands for bisphenol A. It is an industrial chemical that is used to make certain plastics and resins. It is often used and found in water bottles, baby bottles, cups, toys, food cans, baby formula cans, bottle tops, water supply lines, dental sealants, and thermal paper products (cash register receipts). According to the National Toxicology Program at the Department of Health and Human Services, BPA places some concern about the possible health effects of BPA on the brain, behavior and prostate gland of fetuses, infants, and children. The Food and Drug Administration now recognizes this same concern and is seeking ways to reduce human exposure. It is believed to be an endocrine disruptor which can mimic estrogen and may lead to negative health effects. The Environmental Working Group estimates that BPA exposure is ‘unsafe’ in 11 percent of all canned food and one-third of all infant formula. When BPA was detected, the EWG found a single serving contained enough BPA to expose a woman or infant to levels more than 200 times the government’s safe level of exposure for industrial chemicals. In 2010, The National Work Group for Safe markets conducted the study ‘No Silver Lining’ that tested 50 cans 50 cans collected from 19 US states and Ontario, Canada for BPA contamination. Over 90% of the cans tested had detectable levels of BPA. 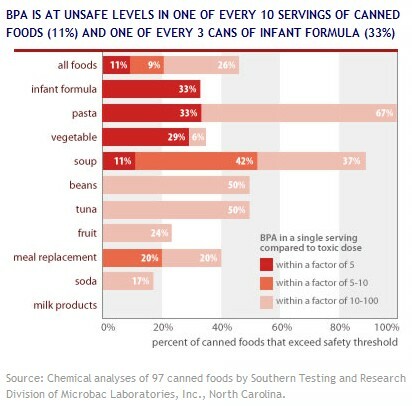 The study’s tests show that meals involving one or more cans of food can “cause a pregnant woman to ingest levels of BPA that have been shown to cause health effects in developing fetuses in laboratory animal studies.” Wow! While I recommend fresh fruits, vegetables, and legumes, I realize that for some it’s just not logical. 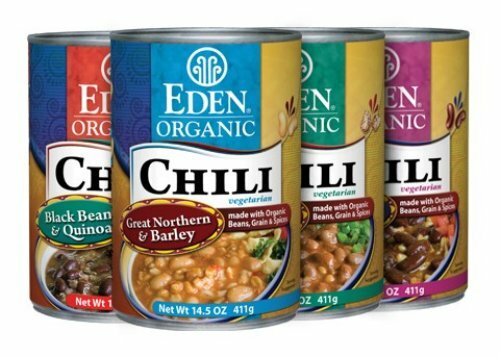 Buying Organic is always what I recommend, but some Organic brands still have BPA in their canned foods. Always look for a BPA free label! Here is a list of BPA Free items that we acquired from the folks at Inspiration Green. Hunt’s Tomato Products: Plain tomatoes only. A good thing to remember is that most all Aluminum Cans are lined with BPA. If you’re unsure, check manufacturers websites and read labels. I also suggest shopping at a grocery store you trust. Healthy Home Market in the Greater Charlotte area is where I find most of my BPA free items. They also carry fresh, local produce and bulk items, such as legumes, that makes it easier to avoid aluminum cans. Hey Brook, Was just reading this today and almost choaked on my food when I read that BPA is in Dental sealants. Wouldn’t you know Gianna just had that done on her baby molars just this morning. Wish I read this sooner….ugh. Hope all is well. Thanks so much for allowing Kim Marcus (my daughter) to bring me to one of your seminars, while I was visiting. Thank you also for all of the information, through your emails. You have started an enormous avalanche of changes in our family. I have just begun my journey to healthful living, but can already feel effects. Again, THANK YOU SO MUCH.